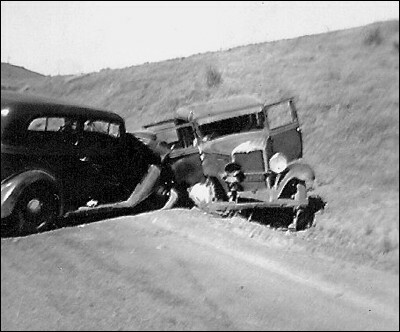 Smash-up near Klamath Falls, Oregon, 1937. My grandparents Daugherty were driving from Medford to Lakeview to pick up their daughter, my aunt Betty, when they collided with another car near the Bend-Klamath junction. Their car is on the right. My parents were also in the car. They were teenagers at the time, three years before they were married. Fortunately, no one was hurt. I'm guessing too much traffic wasn't a factor!